HELP! 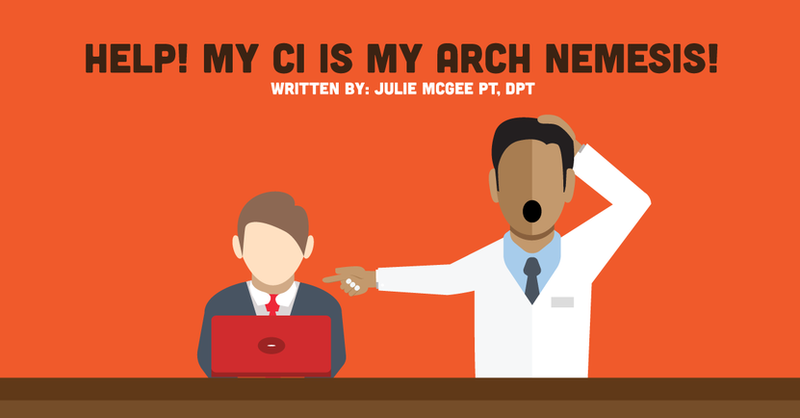 My CI is My Arch Nemesis! At the end of our first year in physical therapy school, we were rewarded with our first full-time clinicals. Previously, we had a few clinical half-days here and there, sprinkled into our classroom-based curriculum. In addition to getting to play the part of a PT, I would also be able to experience a schedule that was more like a working professional, and less like a student. Evenings and weekends to myself where I could watch TV, workout, and socialize with friends without the guilt of taking away time from my studies. My first clinical was in an acute rehab setting. Typically, first year PTs do not go into acute rehab settings. The acute rehab hospital was willing to make an exception because our school needed to have a clinical spot available. I was excited to go into this setting, as I found my neuroscience class to be fascinating. I enjoyed learning about the brain, and its connections, and was looking forward to working with stroke and brain injury patients. Initially, my clinical instructor (or CI) seemed pleasant enough. However, our relationship turned sour as I could tell that my presence, as a student working with her, was a burden. Since I was a first year, I did not have a lot of the knowledge and independence that other PT students (typically in their 2nd year or later) who are doing a clinical rotation in acute rehab typically have. I needed a lot of help in treating patients, developing care plans, and writing notes. At the time, my CI did not have the patience to work with a first year student. Before going into treatments, we would have “discussions.” Here's an example of one. “I’m sorry, we haven’t gone over many treatments for inpatients in my program yet,” I started to explain. Then my CI would laugh. It was this low pitched, slow, “Huh huh huhhuh” as though she were making fun of me and my inexperience. After hastily demonstrating how I might progress with sit-to-stand transfers, we went to see the patient. The treatment where I had a patient initially stand up from a high-low table set at one of its highest settings and then lowered the table as the patient successfully completes sit to stand transfers seemed to help. After the patient was able to stand up from a chair, I realized that I did not know what to do next. I looked over at my CI. She shrugged her shoulders, shook her head and mouthed the words, “What are you doing?” I stopped, my mind racing. What do I do next? There was still plenty of time left in our treatment session. Do we gait train? Transfers? Exercises? Other suggestions were countered with, “Um, no” and then “Huh huh huhhuh.” None of my answers were correct, but I also had no idea if I was on the right track. I felt as though I was thrown into things without any tools to help myself. She would continue to make faces, and shrug her shoulders at me when I was treating patients. When the midpoint of the clinical came, my CI and I sat down together to go over the Physical Therapy Clinical Performance Instrument (PT CPI). My CI had graded me as being below satisfactory on every single item. At the end of our talk, I started to cry. “Should I start looking into other careers?” I asked tearfully. Even though I was in danger of failing this clinical according to the PT CPI, I felt as though I was working so hard. I tried to pick up techniques from treatments that I observed and use them on my own. I picked through charts to read other people’s care plans, and notes, so I would have examples of ones that were done correctly. However, everything that I did was not good enough. I was told “no” and laughed at, but given no suggestions on how to improve. I decided to get my school’s clinical supervisor involved. Since I was trying so hard with my clinical, I needed to do everything that I could to keep from failing. When the clinical supervisor came to the hospital for a visit as she did with all of the students, she spoke with my CI regarding my performance. My professor and CI determined what would be considered passing for me since my CI insisted on grading me so poorly that I would fail otherwise. While I was relieved that there might be a chance that I could pass my clinical, not much changed in regards to my CI’s attitude. When I was treating patients, I felt as though I was walking on eggshells. I only did the things that we had discussed beforehand, or things that I had seen her do with the patient previously. I did not try to do anything new or different. If I had read about a new technique, this was not the place to try or even discuss it. Any time she asked me to write goals for a care plan, or to write a note felt like a cruel joke. Nothing that I would come up with was correct, and I was never told if I was on the right track. Each time my idea would get shot down with a, “no!” or, “um, no”. During the last few weeks of the clinical, I was able to complete one SOAP note without my CI telling me that it was all wrong. I also realized that despite her telling me how bad I was at treating patients, she still let me do it. This probably meant that I was safe with patients. So, I was able to write a note, and I was able to handle patients safely. Those were two items on the PT CPI. There was a good chance that I might pass this clinical! I also started to take note of how my CI would interact with other clinicians. One day she was discussing orthotics with the prosthetist, and out came that laugh. 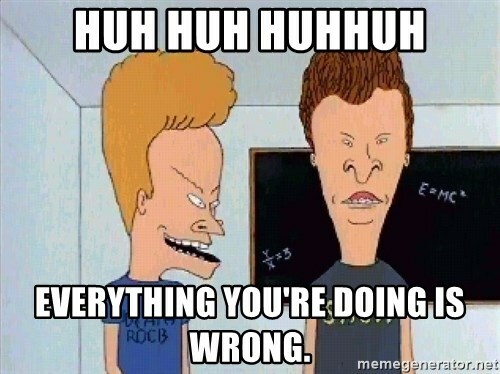 “Huh huh huhhuh.” Again, when discussing a co-treatment with the OT. “Huh huh huhhuh.” This laugh was not my CI making fun of me; the laugh was her nervous habit. Oh the relief to find out that she was just making this gesture to fill the void, and not to make fun of me. The end of this clinical was a day that I was dreading. I knew that if one were to look at the PT CPI for my performance, it would look as though I had failed. My CI and professor had come to an agreement, that if I had scored a satisfactory on a few items revolving around safety, and I was 75% towards satisfactory on most of the other items, I would pass. We went through the PT CPI, and while the comments on my performance didn’t change much, my performance had inched closer towards being satisfactory. I had passed the clinical. What a relief! Then, I was given an opportunity to provide my CI with some feedback. Feedback is important. Feedback is an indicator on how we are doing, but it needs to be balanced. While it is important to know what was done incorrectly, and needs to be improved, there should be feedback that contains some positives. The positive feedback is not only a morale booster; it gives an indication of where we are doing well. Knowing one’s strength is just as important as knowing one’s weaknesses. Knowledge of one’s strengths can help to improve on weak areas. For example, I am typically well-organized and methodical in my treatments; however, I am not always great at communicating with other disciplines regarding a patient’s status. Once I realized this, I started to consider communications with others as part of my treatment. For example, before seeing a patient in the hospital I would routinely either check in with their nurse, or fellow rehab professional (OT, SLP). I thought of it like a box that I needed to check off to complete the treatment. This practice would pay off because I typically felt better prepared for treatments. What I learned...and my advice to you if your CI is your arch nemesis. Dealing with a bad CI is not easy. My best advice is to survive by learning how to play according to their rules. You should keep trying your best, and don’t expect them to change. While your bad CI may make you want to be rude, and treat them the same way that they treated you, it may be in your best interest to take the high road. The world of physical therapy can be surprisingly small. Any bad behavior on your part may cause you to be passed over for job or residency opportunities. Luckily, my bad egg of a CI did not completely turn me off from being a physical therapist. After that experience, I was fortunate enough to work with other CIs who were not only talented therapists, but also wonderful teachers and leaders. I have gone on to be a CI myself, and understand that as CI you must be patient and help to student to fill in the gap between the theory that is taught in school, and its practical application. Most importantly, I have learned the importance of constructive criticism. This type of feedback involves letting the other person know not just about their weaknesses, but also their strengths. Constructive criticism is a tool that I use almost daily whether working with colleagues, support staff, or patients.